The Nimble Smart Contacts App allows you to see insights on all of your contacts instantly, anywhere you work. It’s available to use Nimble on top of any existing website or web application you use at your company. And you can even use the app within your Gmail inbox. Access all the functions of Nimble while you work on any website, app, or in your Gmail inbox. Before getting started, make sure that you have Cookies enabled for Nimble in your Chrome's settings. If the app window is blank, you must update your settings in Chrome's cookies to add an exception for "app.nimble.com" and "nimble.com"
After you install the widget, please restart Chrome to finish the installation process. 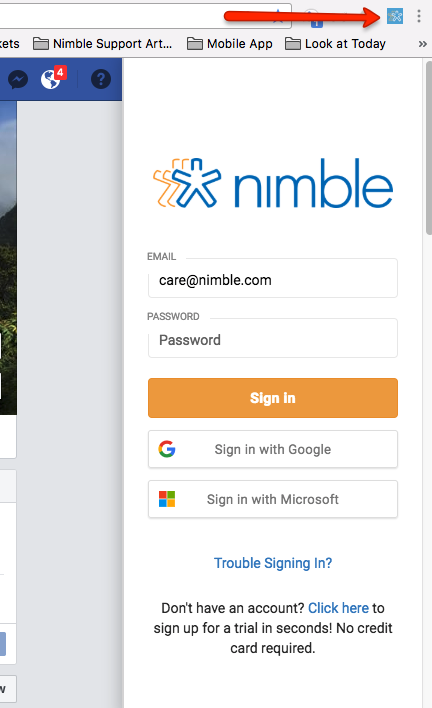 Click on the "Nimble" logo on the top-right menu of Chrome and sign into your account. 4. 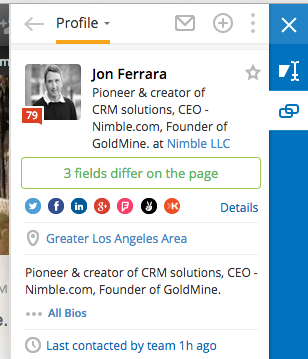 Once signed in, you'll be good to go to look up your profiles and add more contacts to your Nimble account! Current App Users: This widget has different permissions than our prior release, and you will need to toggle the extension on and off in chrome://extensions, then selecting "Update" in the top-center, as shown below. 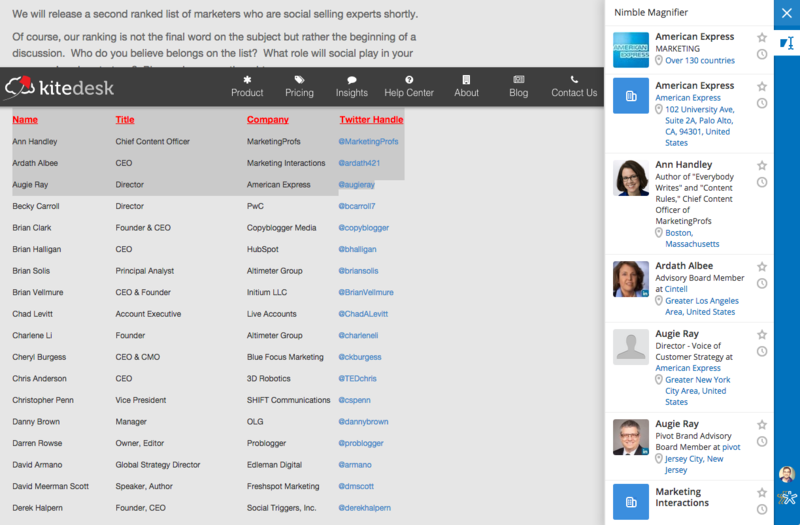 The Nimble Smart Contacts App is enhanced to work on Twitter, Facebook, AngelList, CrunchBase, Google+, HootSuite, Salesforce, Foursquare, Intercom.io, and more! You can also highlight text on any website and Nimble will do a text look up for that contact or company. Email, call, log tasks, notes, or view any contact details from within Gmail. For this example, we are going to use Facebook to add a profile. Click on the Nimble button on the browser toolbar, and we will automatically show that contact's "Live Profile" or bring up their existing Nimble profile.